Well, that was different: Bonhams staged a special auction, complete with a 56-page catalog, to sell just one vehicle, though for a very special reason. Well, that was different: Bonhams staged a special auction, complete with a 56-page catalog, to sell just one vehicle, though for a very special reason. As it turned out, for 596,482 special reasons. 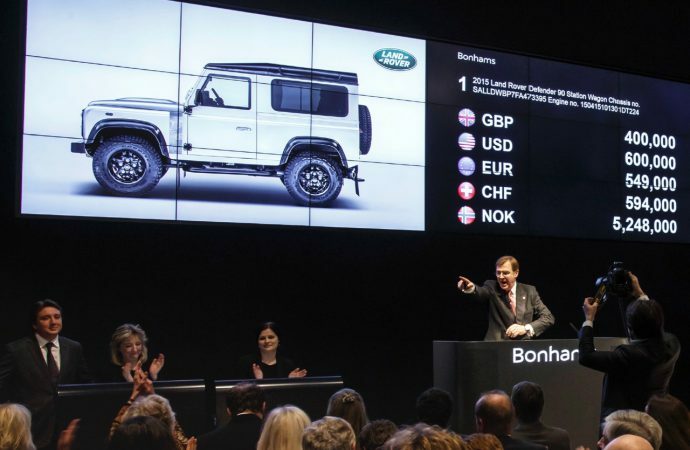 The vehicle was the two-millionth Land Rover Defender produced — production began in 1948 — and all $596,482 of the dollars (£400,000) paid for the car are being donated to Land Rover’s humanitarian and conservation partners, including the International Federation of Red Cross and Red Crescent Societies, which will use the money to help communities in Nepal as they recover from natural disasters, and the Born Free Foundation, which will use the funds to conserve wildlife in Kenya’s Meru National Park. 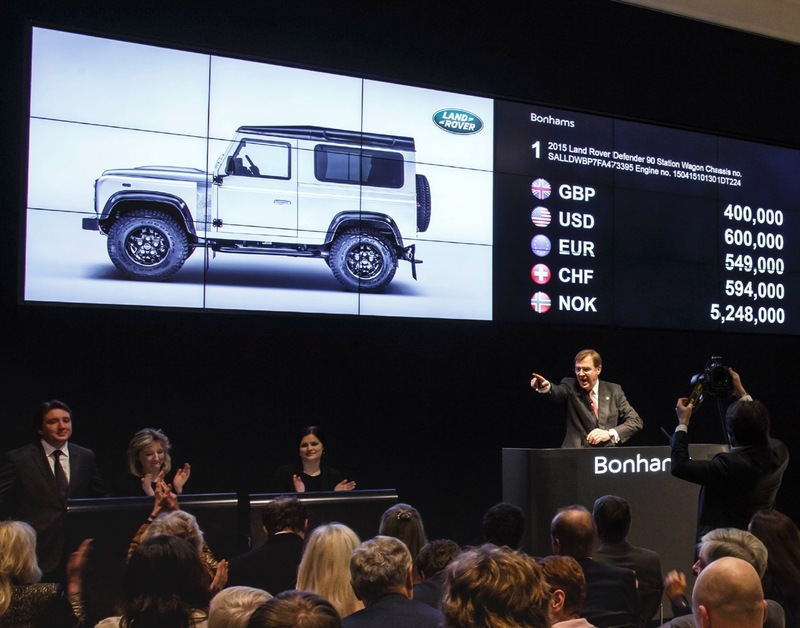 The one-of-a-kind Land Rover Defender goes to the high bidder, who is from Qatar. “Earlier this year, we had the opportunity to turn a milestone Land Rover into a true collector’s car,” John Edwards, managing director of Jaguar Land Rover Special Operations, said in a news release. “With the expert help of my SVO team and a handful of willing Land Rover ambassadors, we created something unique and very special. 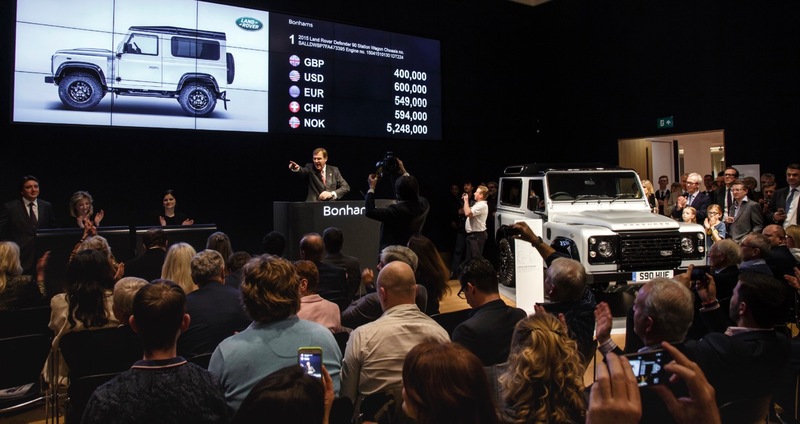 The one-off Defender was built at Land Rover’s Solihull plant in May, with Stephen and Nick Wilks, sons of the company’s founders, among those having a hand in the car’s creation. Also taking part was Virginia McKenna, founder of the Born Free Foundation. The special Defender was built with distinctive and bespoke features including an engraved map of Red Wharf Bay, where the design for the original Land Rover was first drawn in the sand, and a unique “No. 2,000,000” badge, with the map and badge repeated inside the 4×4 on the leather seats. An aluminum plaque was signed by everyone involved in the vehicle’s assembly and the vehicle wears special license plates in tribute to those on the first pre-production Land Rover. The sale wrapped up a week in which Bonhams also concluded its Motoring Division sales for 2015 with the December auction at the RAF Museum in Hendon. The top sellers at that sale were a 1926 Bentley 3-litre “Light Tourer” for $419,774, a 1939 Bentley 4 1/2-litre drophead coupe for $378,020 and a 1982 Ferrari 512 BBI coupe for $277,811. Bonhams Motoring Dept. launches its 2016 calendar January 28 in Scottsdale, Arizona.